Employer Coverage Tool is a form intended to assist employees in gathering information about health coverage offered by an employer. Although the Employer Coverage Tool will not be submitted to the Exchange with the individual’s application, employees can use the information provided in this form to help them answer questions in the Exchange application. It makes the whole process more streamline and more efficient. 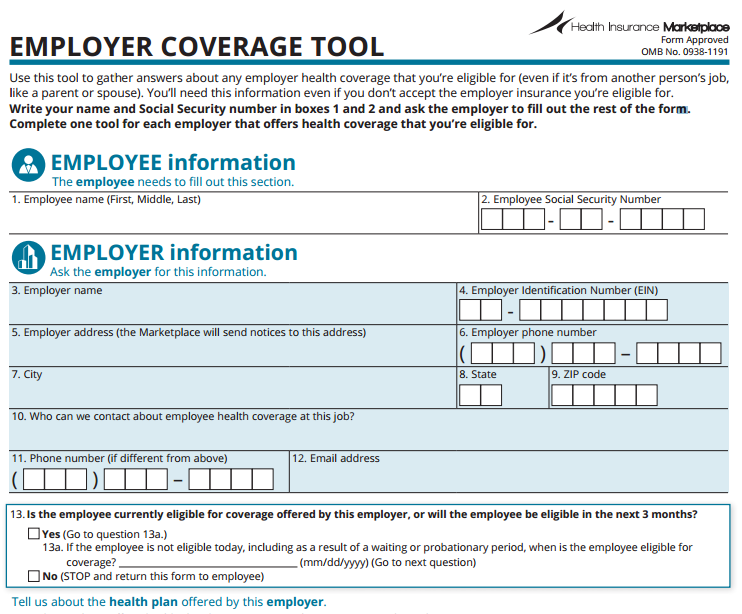 You can download the Employer Coverage Tool (.pdf) here. This entry was posted in Affordable Care Act and tagged Download Employer Coverage Tool, Employer Coverage Tool, Employer Coverage Tool .pdf, Employer Coverage Tool Form on September 30, 2013 by Affordable Care Act.